← AYP is nothing like credit card fraud prevention…but I wish it were. As an English teacher, I have the arrogant (and lame) hobby of looking for proofreading mistakes in the real world. I take pictures of billboards, signs, shop windows, product packaging – anything that has some blatant (or sometimes not-so-blatant) error in spelling, grammar, or usage. I bring these into my classroom and use them as warm-ups for my students. This gives them something authentic to work with, and it shows them the importance grammar plays in effective real-world communication. Hi everyone this is me and my family [I removed the picture] we just moved here about 6 months ago. I just started a job at Carl Black selling cars. 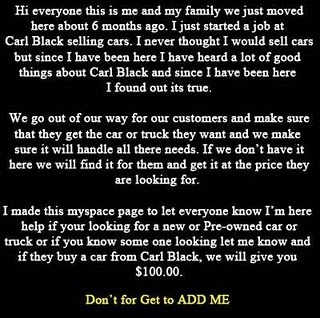 I never thought I would sell cars but since I have been here I have heard a lot of good things about Carl Black and since I have been here I found out its true. We go out of our way for our customers and make sure that they get the car or truck they want and we make sure it will handle all there needs. If we don’t have it here we will find it for them and get it at the price they are looking for. This is a screencap of a real solicitation I received on my MySpace account (don’t laugh…it was like, 4 years ago, ok? I don’t use MySpace anymore). The class can then revise and edit the advertisement to correct the mistakes, clarify the message, and make it more effective. Compared to standard “grammar in isolation” instruction, I believe something like this is far more engaging for students. I have a whole folder of images like this if any teachers out there are interested. Great teaching tools. This entry was posted in Adventures in teaching, Fun Stuff, Lessons and tagged advertising, carl black, education, English, errors, grammar, grammar in isolation. Bookmark the permalink. This will be a great warm-up.I am a teacher too and I would love to do the same. Could you send me some stuff like this, please? It will be helpful. Thanks! I’m glad you’ll be able to use it. I have a few more of these posted on my wiki that you can use. You won’t believe it! I have used your materials yesterday and my students were so exciting about them. Thanks you so much. The materials were exciting. Therefore the students were excited.